Formulated to work like your eyes, it provides up to 20 hours of moisture. If you are a contact lens wearer you will only brands you can trust. The eyes are one of the most sensitive organs of the body, and you cannot afford to use just about any product to care for them. Wearing contact lenses entails a lot of effort and responsibility. Maintaining clean, germ-free lenses are your foremost concern. And Bausch and Lomb, a leading brand in contact lens products understands this. 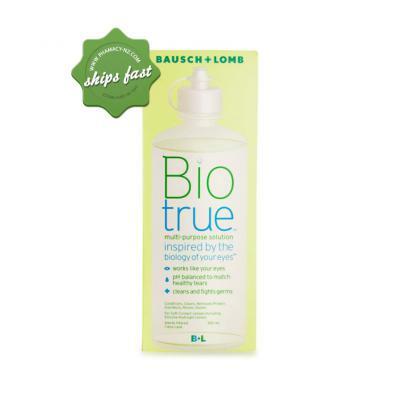 This is why they developed Bausch + Lomb Biotrue Multipurpose Solution. It promises to help make wearing contact lenses easy on your eyes because it is formulated to match the lubricant naturally found in your eyes. Hydrates contact lenses the same way the eyes naturally hydrate. Acts as the eye's inborn germ-fighter. Keeps lenses moist up to 20 hours. Utilizes hyaluronan (HA) - a lubricant found in the eyes. Keeps proteins in their native state, similar to what is naturally present in the eye. 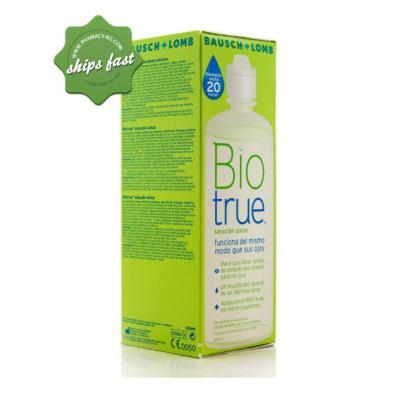 Place at least 3 drops of Biotrue multipurpose solution on each side of lens surface and gently rub for 20 seconds. Thoroughly rinse each side of the lens for 5 seconds with Biotrue multipurpose solution. Place cleaned contact lenses in the lens case and fill with fresh Biotrue multi-purpose solution. Soak at least 4 hours. Remember to always use fresh solution - discard solution from lens case after each use. Your lenses are now ready to wear. If any debris remains on contact lenses, rinse with Biotrue multipurpose solution prior to insertion. If not wearing contact lenses immediately store them in a closed lens case. 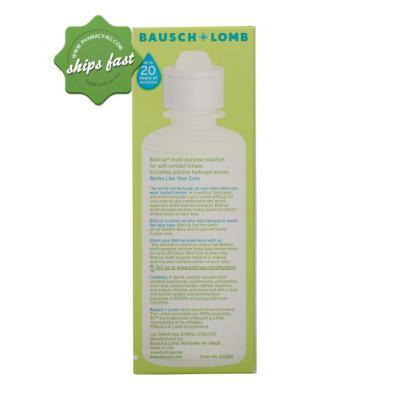 Do not store your lenses in simple saline in place of Biotrue multipurpose solution. Saline solution will not disinfect. Lenses may be stored in the unopened case until ready to wear, up to a maximum of 30 days. 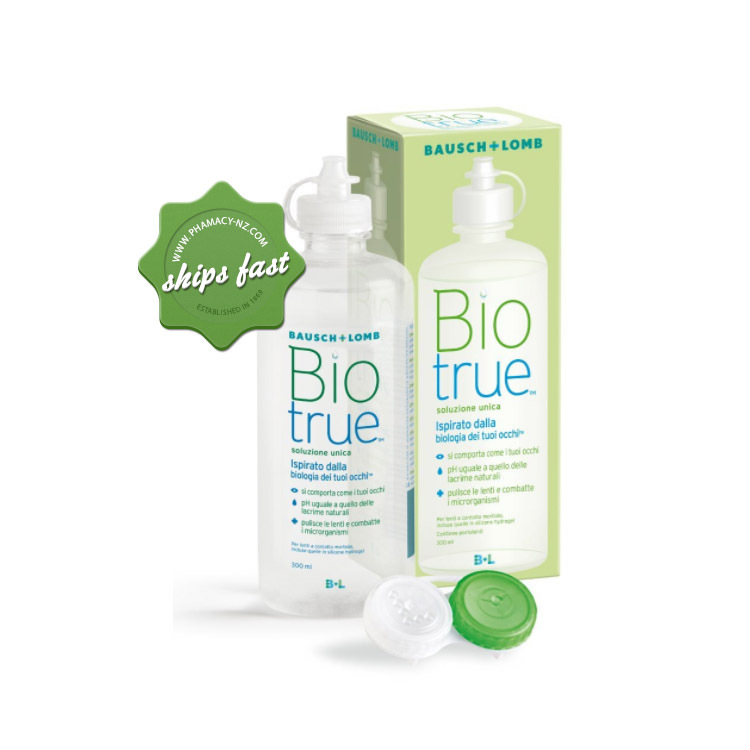 If you store your lenses for longer periods of time, they must be cleaned and disinfected with fresh Biotrue multi-purpose solution prior to lens insertion. Always follow your eye care professional's instructions. Based upon your individual tear chemistry and lens-wearing schedule, your eye care professional may recommend additional products or procedures. Failure to discard solution from lens case after each use or use of water to care for your lenses may lead to contamination resulting in eye injury and potential loss of vision. Do not use heat disinfection regimen. If you are allergic to any ingredient in this product, do not use. Problems with contact lenses and lens care products could result in corneal infection and/or ulcer and lead to loss of vision. It is essential that you follow your eye care practitioner's directions and all labeling instruction for proper use of lenses and lens care products, including the lens case. Eye problems, including corneal ulcers, can develop rapidly and lead to loss of vision. Daily wear lenses are not indicated for overnight wear and should not be worn while sleeping. Clinical studies have shown the risk of serious adverse reactions is increased when these lenses are worn overnight. Extended wear lenses should be regularly removed for cleaning and disinfection or for disposal and replacement on the schedule prescribed by your eye care professional.